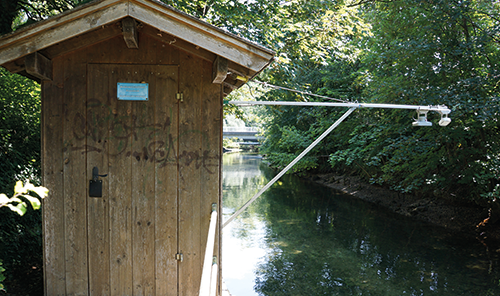 On behalf of the Bavarian State Office for the Environment, WWA Rosenheim operates the gauge of the Bad Aibling Triftbach state measuring network – which has been in use for some time now. 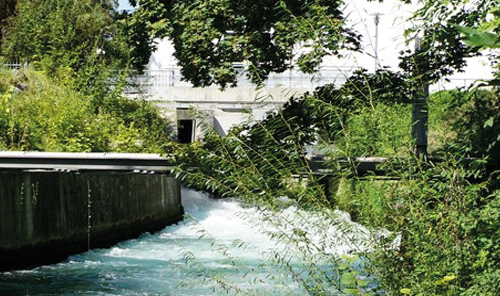 The existing water level measurement was supplemented by a flow measurement. The flow rate is now determined by measuring the surface velocity with the OTT SVR 100 (Surface Velocity Radar). In parallel, an OTT RLS (radar level sensor) determines the water level by means of radar measurement. Both sensors transfer the measurement data to the OTT netDL 1000 data logger. The data logger stores the calculation of the flow rate from the two measured variables. The flow rate is stored as a separate channel in the data logger and is available as a calculated value. By means of the OTT PRODIS software the flow calculation can be calibrated by comparison measurement at different water levels/flow rates. In the case where no comparison measurements are available, standard calibrations can be used. The monitoring solution has a modular structure. This means that existing water level sensors and data loggers can continue to be used and a flow velocity measurement can be added cost-effectively. The water gauge house Bad Aibling Triftbach with OTT SVR 100 and OTT RLS. The Mangfall river: challenging conditions for reliable measurement. The OTT SVR 100 is an important addition to the existing product portfolio for flow measurement and will in future make a major contribution to water monitoring and flood protection, especially in small and medium-sized water bodies. Due to the simple integration into existing systems, simple water level only stations can be easily retrofitted to measure flow. Do you have a similar measuring point where flow measurements are not possible or only with great effort?